Yesterday was one of those work days where I thought that things would be fairly quiet. I had a handful of meetings on my calendar, but otherwise, my plan was to catch-up on some of the work that was piling up because of the ongoing sickness circulating in my office. By 10am, though, it was clear that not only wasn’t it going to be a quiet day for me, but also it wasn’t going to be a day for me to catch-up on work and emails. Between unexpected meetings, a few problems that popped up out of nowhere, and a few people being slow to finish their part in a project, I ended up have to stay at the office late and was answering my blackberry long after I was home. 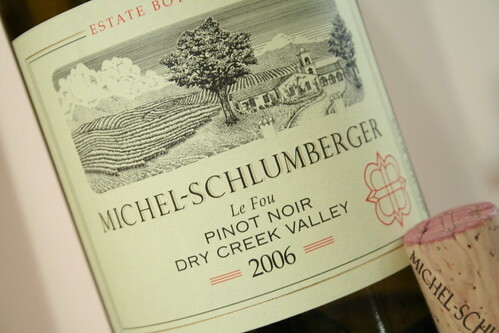 However, answering the blackberry didn’t stop me from wanting to indulge in a glass of wine, and since I’m feeling 90% better, the bottle I opened was the first bottle in several weeks that I opened with the intent of writing a review—the 2006 Michel-Schlumberger ‘Le Fou’ Pinot Noir. I purchased this wine while I was out in California for the wine bloggers conference (WBC09). While I haven’t had a chance to write about my walking tour of the vineyards yet, they were wonderful. After exploring the vineyards, I had a chance to taste a number of the wines being made at Michel-Schlumberger and because I enjoyed what I tasted, I couldn’t resist the opportunity to purchase a few bottles. With the feeling of adventure, 2 or 4 bottles I purchased were actually ones that I didn’t taste while I was there. Since the Pinot Noir was one of the untasted wines, it was a bottle that I was looking forward to opening and, therefore, was saving it for a night where I could indulge in little bit of “me” time. The 2006 Michel-Schlumberger ‘Le Fou’ Pinot Noir (winery, snooth) had a beautiful, medium ruby color. On the nose, there were animal notes mixed in with bright raspberry, cherry, and pomegranate aromas. In the mouth, the raspberry, cherry, and pomegranate flavors mixed nicely with warm spices—mostly cinnamon and nutmeg. The wine had low tannins, medium-to-high acidity, and light-to-medium body. Is this worth a glass after work? Definitely! If you see this wine in the store, grab it; you won’t be disappointed. At $32, this wine is the perfect bottle to make you feel like you’ve indulged a little without breaking the bank. The Pinot Noir is a nice, food-friendly wine that easily transitions to drinking alone. For dinner, I paired the wine with a grilled basil-garlic chicken, which actually brought out a slight vegetal and mineral aspect in the wine, which was quite unexpected, but very pleasant. As an evening snack, I paired the wine with homemade zucchini bread, and the spices in the bread accentuated the spices in the wine to create a nice fall weather combination. I enjoyed that Pinot Noir too. It's interesting that some were skeptical about Pinot Noir being grown at this location, but it's turned out well. Tim, you're absolutely right. I can see where the temps may not cooperate every year, but overall, the Pinot Noir definitely seems to be a success.